A “near-future release of Honeycomb” (Android 3.2?) is on the way and will include a new zooming feature to make all of those non-tablet apps function much more properly on your big-screened device. Since many developers have not created or updated their apps to have tablet-specific features, this new zoom option should help end users out. 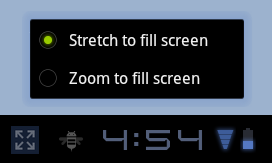 If you were to choose the new “Zoom to fill screen” option, the app will essentially switch over to how you would expect the app to look on a phone. It’s more of an emulated size that is then blown up to match your larger screen, making it much easier to use certain apps. A great example is in the picture at the top of this post.